EPDM Roofing Systems are single-ply membranes made of synthetic rubber, making them lightweight and simple to install. Current EPDM Roofing Systems are incredibly durable, puncture resistant. 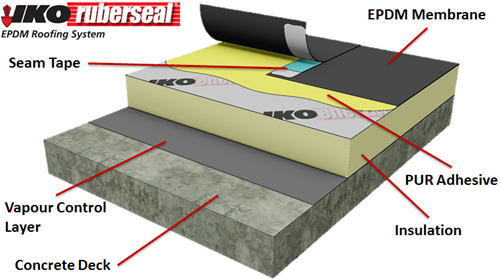 EPDM Roofing Systems are applied using a fully-adhered glue system, loose-laid with gravel or mechanically fastened. Some argue that this type of roofing system is not the most aesthetically pleasing but then that is generally insignificant to a building owner. Alternatively, this type of roof is available in different colours like black, grey or white to provide cool roofing benefits and it can be manufactured in wide rolls to minimize the number of seams, in turn, lessening the chance of water infiltration. Made out of recycled materials, making them environmentally friendly. Reflects heat, cuts cooling costs in the summer and also acts as an insulator to help cut costs in the winter. Typically last 30-50 years and hold up well against wind, water, and even fire, as most are fire retardant. Dry conditions are required for proper installation of the rubber adhesive. 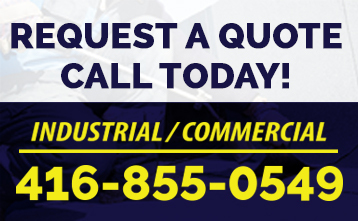 Faulty installation can cause bubbling, blistering, and tearing of the EPDM.